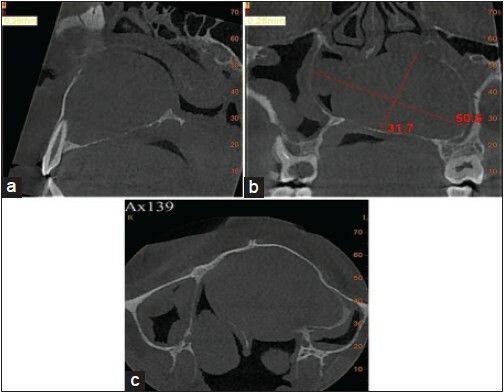 In this article, we aimed to present a case of giant radicular cyst invaded the entire left maxillary sinus major portion of the inferior nasal cavity and extending to the right maxillary sinus. We decided to introduce this report because yet to the best of our knowledge, there are precious few cases with such extension. A 21-year-old male was attended in our department with a major complaint of pus drainage from the anterior region of the upper jaw. His medical history was unremarkable. Extraoral examination did not reveal any facial asymmetry. 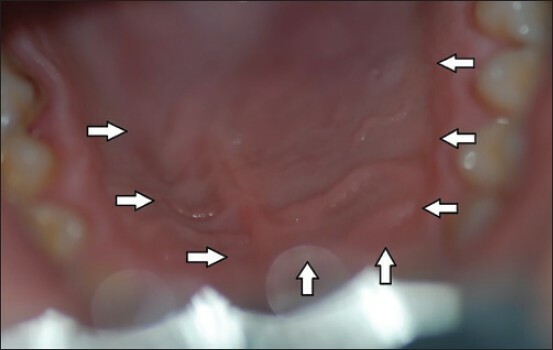 During intraoral examination, pus drainage from the gingiva between the teeth numbered 22 and 23, and discoloration and opacity on the teeth numbered 22 were observed. In addition, there were deep caries on the teeth numbered 16. Furthermore, a fluctuant and painless swelling was extending from left canine tooth to the right molar region. It was covered with intact mucosa and more pronounced at the palatal region of the left maxillary molar region [Figure 1]. Electrical pulp test revealed that all maxillary teeth, except the numbered 22 and 16, were vital. Panoramic radiographic examination revealed a well-defined uniform radiolucent lesion extending from the maxillary right molar region to the left molar region. Its lower sclerotic border was more pronounced. The tooth numbered 22 was distally migrated. The tooth numbered 23 was deeply decayed and had a chronic periapical periodontitis at the apex of the root [Figure 2]. To determine the actual extension and borders of the lesion, cone beam computerized tomography (CBCT) (Newtom 5G, QR, Verona, Italy) was utilized. In the axial, coronal, and sagittal CBCT images, a radiolucent lesion, that invaded the entire left maxillary sinus and the major portion of the inferior nasal cavity and extending to the right maxillary sinus, was detected. The approximate dimensions of the lesion were 31.7 mm × 50.6 mm [Figure 3]a and b]. It was also discovered that the radiolucent lesion at the apices of the tooth numbered 16 was not related to the huge radiolucent lesion [Figure 3]c]. The three-dimensional reconstructed CBCT images indicated that the huge lesion caused bone resorption around the roots of the teeth numbered 23, 24, and 25, and a major part of the relevant palatine [Figure 4]a and b]. 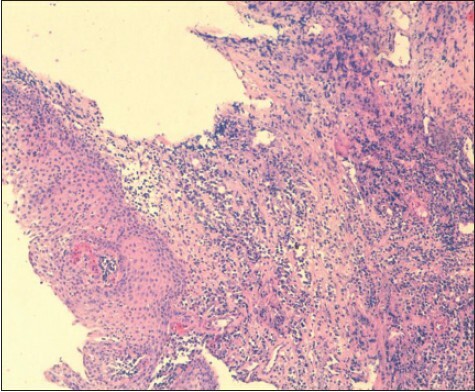 The histopathological examination of the lesion specimen indicated drastic inflammation composed of plasma cells, lymphocytes, neutrophils, and leukocytes in the intraepithelial and sub-epithelial areas of the cystic structure, which was covered with multilayered squamous epithelium. This structure was reported as inflamed radicular cyst. [Figure 5]. Under general anesthesia, the patient underwent a surgical procedure that included surgical enucleation of cyst, apicoectomy and retrograde filling of involved teeth. After administration of local anesthesia, a crevicular incision was made in labial region 15-27, and a full-thickness mucoperiosteal flap was reflected. A large cyst cavity window was prepared with a rounded bur. Enucleation of the cystic lesion was performed, and it was sent for histopathological evaluation. Maxillary sinus and nasal floor perforation did not occur. Root apices of 22, 23, 24, and 25 were resected and retrogradely filled with mineral trioxide aggregate. Hemostasis was maintained by an oxidized cellulose hemostatic agent that was placed over the maxillary sinus mucosa and nasal mucosa. Flap closure was done with 3-0 Vicryl. Postoperatively the patient was kept on antibiotics and analgesics. Considering the possible irregularity in appointments, since the patient was moving to another city, where efficient health centers were not available; enucleation, instead of marsupialization, was preferred. The radicular cysts generally grow slowly and extend either to the anatomical neighboring such as sinuses, nasal cavities, vestibule, or palate. The extension of the odontogenic cysts to the maxillary sinuses is in relation with the proximity of the lesion to the sinuses. The type of the lesion has no effect on this extension. Infected cysts show symmetric expansion and diffuse to the spaces like sinuses or nasal cavity at the points where the bone is weak. Because of this, they remain asymptomatic and do not cause asymmetry unless sinuses are completely filled. , Similarly, the cyst in our case was extended to the maxillary sinus and nasal cavity without any symptoms. For a definite diagnosis, histopathological examination, pulp vitality tests, long-term follow-up, and repeated histopathological examination are useful. In our case, all maxillary teeth responded to vitality test except numbered 22, which had been proposed as the cause of the cyst. The results of the histopathological examination of both initial incisional biopsy, and the totally excised mass were radicular cyst. Since the patient would not be able to return for follow-up, he was informed to refer to a faculty of dentistry close to the city he was living. The treatment of the radicular cysts is determined in association with the type and volume of the lesion. Small cysts usually heal up with successful endodontic treatment. In case of huge lesions, in order to avoid possible complications like pathological fractures, first minimizing the lesion with marsupialization and later total excision is the appropriate choice of treatment. ,, Although the dimension of the lesion in our case directed us to choose marsupialization as treatment, otherwise considering the fact that the patient would not be able to go to controls, enucleation should have been chosen. With this report, it was aimed to present how a radicular cyst can show an extensive-destructive character, to emphasize the role of CBCT on diagnosis, and besides these, to give information on the treatment methods of the cystic lesion. 1. Shear M, Speight P. Radicular cyst and residuel cyst. 4 th ed. Oxford: Blackwell Munksgaard; 2007. 2. Sagit M, Guler S, Tasdemir A, Akf Somdas M. Large radicular cyst in the maxillary sinus. J Craniofac Surg 2011;22:e64-5. 3. Neville BW, Damm DD, Allen MC, Bouquot JE. Oral and Maxillofacial Pathology. 3 rd ed. Philadelphia: Elsevier; 2010. 4. White SC. Pharoah MJ. Oral Radiology. Principles and Interpretations. 6 th ed. St. Louis: Mosby Elsevier; 2009. 5. Delbem AC, Cunha RF, Vieira AE, Pugliesi DM. Conservative treatment of a radicular cyst in a 5-year-old child: A case report. Int J Paediatr Dent 2003;13:447-50. 6. Lee JY, Byun JY. Huge radicular cyst. Otolaryngol Head Neck Surg 2010;143:704-5. 7. Riviº M, Va¢ leanu AN. Giant maxillary cyst with intrasinusal evolution. Rom J Morphol Embryol 2013;54:889-92. 8. Büyükkurt MC, Yolcu Ü, Aras MH, Yavuz MS, Ayrancý F. Maksiller sinüste geniþ hacimli radiküler kist (vaka raporu). Atatürk Üniv Diº Hek Fak Derg 2008;18:33. 9. Pekiner FN, Borahan O, Uðurlu F, Horasan S, Þener BC, Olgaç V. Clinical and radiological features of a large radicular cyst involving the entire maxillary sinus. Müsbed 2012;2:31-6. 10. Chaine A, Pitak-Arnnop P, Dhanuthai K, Bertrand JC, Bertolus C. An asymptomatic radiolucent lesion of the maxilla. Clear cell odontogenic carcinoma. Oral Surg Oral Med Oral Pathol Oral Radiol Endod 2009;107:452-7. 11. Pitak-Arnnop P, Dhanuthai K, Hemprich A, Pausch NC. Huge radicular cyst of the maxilla: Some clinicopathological considerations. Otolaryngol Head Neck Surg 2010;143:853.